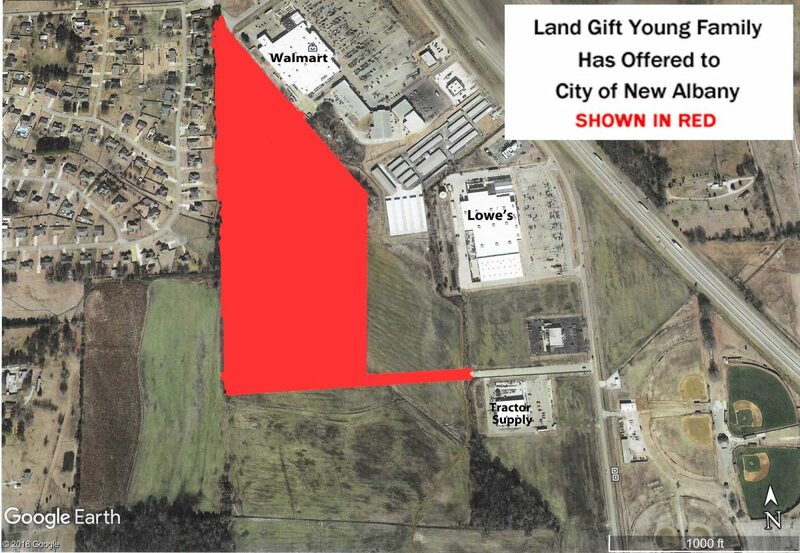 The 26 acres of land shown in red have been offered as a gift to the City of New Albany. The City of New Albany will be free to use the value of the Young family land gift for any city improvement. “We would like to see them use much of the money for improvements in the older parts of New Albany — rebuilding sidewalks in the historic neighborhoods, building or improving parks in the neighborhoods, sprucing up city hall, and so forth,” Terry Young said in a conversation last week with NAnewsweb.com. As previously reported, Young offered, at the August 7 meeting of the New Albany Board of Aldermen, to give the city about 26 acres of prime commercial land. He said then that the only condition of the gift was that the city extend the street known as Virginia Way 1,300 feet further west. It is expected that most of the funds for building the 1,300 foot extension of Virginia Way would come from grants. The Young family has offered to cover part of construction costs that may exceed the amount of grants. There have been public discussions of perhaps using the donated land for building a new headquarters for New Albany Lights, Gas, and Water (NALGW) or a new police department building or both. However, Terry Young says the New Albany Board of Aldermen is free to use the capital value of the land gift for any improvements. The land the Young family has offered to give to the city is valued between $1.2-million ($1.06/sq. ft.) and $1.8-million ($1.59/sq. ft.). Land in the same area has sold for more than $3.00 per square foot in recent years. Once the 26 acres is deeded over to the city, its value can be used as “in-kind capital” in applying for the grants that have become one of the main sources of financing for local municipal and county improvement. The concept of the Community Development Block Grants (CDBG) was started during the administration of Gerald R. Ford in 1974. Those grants generally require a 20% match from the local government receiving them. Thus, if the Young Family gift is valued at $1.2-million it could result in grants of up to $6-million, or $9-million if the land is valued at $1.8-million. The 26-acre land gift offered to the city lies immediately west of Park Plaza Drive. More than a quarter century ago, John Young, Terry Young’s father, started commercial development in the area west of what is now Interstate 22. The Walmart store there was one of the earliest new buildings. In 1993, John Young was approached by New Albany city officials and asked to donate the land for the right-of-way of that portion of Park Plaza Drive which now runs south of Walmart to Bratton Road. He gave the city a right-of-way 60 feet wide and about 4,500 feet long. The city received a federal grant that paid for most of building the new street. Young also split the road construction costs, over and above the amount of the grant, 50/50 with the city. Since 1993, Lowes, El Agave Restaurant, Zaxby’s Restaurant, the Tractor Supply store, etc. have been opened on Park Plaza Drive, which is now one of the busiest streets in the city. Terry Young said his family hopes the city board will formally accept the offered 26-acre land gift by the end of this calendar year.